A London Hospital Scandal -1901. 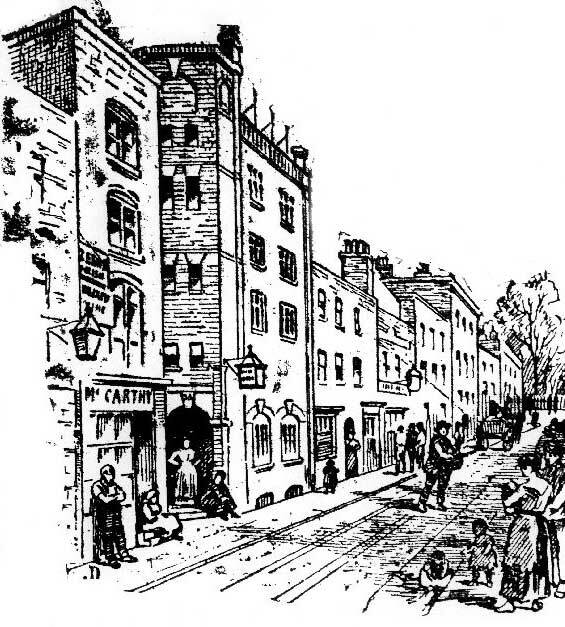 On Sunday, May 26th, 1901, Mary Annie Austin was stabbed at a common lodging house in Dorset Street, Spitalfields. She was taken to the London Hospital, where the doctors were unable to save her life, and she died the next day. As a result, the crime became yet another murder investigation by the Metropolitan Police that was centred on Dorset Street. Dorset Street, Spitalfeilds. From Lloyd’s Weekly Newspaper, 2nd June 1901. Copyright The British Library Board. The murder of Annie Austin, at first at least, was seen as a possible return of Jack the Ripper to the neighbourhood that he had terrorised thirteen years before, although this theory was quickly dismissed. Several newspapers, however, picked on the fact that, as far as could be seen, after she had been taken to the London Hospital, she had had to wait a long time before being seen by a doctor, and some of the papers wondered if this delay may have contributed to her death. These same newspapers were also critical of the hospital staff for not immediately notifying the police that a potential crime had taken place. “To the Editor of the East London Observer. Sir, – As a rule, it is hardly worth while to answer paragraphs headed “A Hospital Scandal”, – which from time to time appear it the Press, to satisfy, I suppose, a natural craving for sensation. But occasionally one is goaded out of silence. I declare it is disheartening to find how ready editors, especially of evening papers, are to insert these paragraphs without any attempt to get at the truth from the hospital attacked. They would not dare to treat us like this if we were individuals, and could bring an action for libel. We are trying to do our best here at the London Hospital to meet an overwhelming amount of work amidst the very greatest difficulties, cramped for room, cramped for money, disturbed by rebuilding; and if our vast machinery, which last year treated over 12,000 in-patients and 200,000 out-patients, breaks down over one case we are hounded as if we are cruel murderers, just for the sake of making a sensational paragraph to help sell papers. A mistake made is quite painful enough to the surgeon, young man, nurse. or even chairman who has made it, without the extra punishment of wide publicity. I suppose I shall be told that I am too thin-skinned, and that these attacks are best left alone. That may be, but this last libel on this hospital in connection with what is called “Another Jack the-Ripper Murder” is so unfair and so untrue that I ask you to insert the facts. The accusation, shortly, is that a poor woman was brought in on Sunday morning at half-past nine, and was not seen between then and half-past nine p.m., and “was left in a dying condition for twelve hours unattended,” and that the house surgeon did not communicate with the police until the next day. Taking the last point first, we are not detectives at a hospital, and it is not our business to communicate with the police at all. As a fact the house-surgeon, directly he noticed the woman was getting worse on the Monday morning, up to which time he had no reason whatever to think she was in any danger, did telephone to the police. One editor is good enough to tell us that his duty was to go out and call in the policeman outside the gates. We tried to do this once. The policeman was on the other side of the road, and replied that the hospital was outside his district! But surely the duty of communicating with the police lay with the doctor who was first called in to see the stabbed woman, or with the lodging-house keeper where the stabbing took place? Whitechapel Road, With The London Hospital To The Right. Now, as to the supposed neglect. I will not claim any indulgence or found any excuse on the fact that Sunday happened to be an exceptionally heavy day. This young house-surgeon had been up till late on Saturday night with four such serious cases that he had, contrary to our own rules, to get the visiting surgeons down on Sunday to do four grave and lengthy operations on them. In addition to this, he had to see and dress, with the assistance of others, all the patients under his care, and to attend at once to those newly brought in. The woman was brought up to the ward at ten o’clock. He saw her at once. Her wounds had been properly dressed by the surgeon who sent her in to the hospital. He decided that it would be best, for many reasons, to leave her quiet till the evening, when she would be given an anaesthetic, and the wounds sewn up. Her pulse was good, no signs of collapse, all bleeding had ceased, and she seemed well and in no great pain. Twice during Sunday that house-surgeon visited her and received a report from the Sister of the ward that she was just the same, and quite comfortable. Satisfied as to this, he adhered to his decision to do nothing till the evening. When the fuller examination was made (he kept her case to the last, owing to various causes which I cannot mention) he found that none of the wounds were serious, but he discovered something which led him to make a further examination, and then he found that a serious injury had been done to her elsewhere, which I cannot describe, but which injury was out of sight. The delay in discovering this made no difference at all, nothing could be done to this wound. He saw her again at half-past two a.m. on Monday morning, and found her as well as could be expected, with absolutely no reason for anxiety. He then – it was the first time he had seen her conscious since he had discovered the very grave injury – asked her some questions about how it happened, whether the stabs were self-inflicted or whether anyone had done it to her. The poor woman would not speak out until she was assured that she would not be turned out of the hospital, and then she told the story which is in evidence. He saw her again at nine a.m., and even so late as that there was nothing whatever to indicate that the end was near or that she was in any serious danger from the injuries. But in passing her bed again at ten o’clock he saw a great change had come over her, and he then at once telephoned to the police. The police arrived at twenty minutes past eleven, they say – as a fact, it was not till a quarter to twelve – and she died at half-past eleven, before they came. I am sorry to write at such length; but, in justice to this young man, and in fairness to the hospital, I think I may ask that equal publicity should be given to the facts as to the attack. I do not at all wish to claim for hospitals that they should have immunity from criticism; on the contrary, it is a safeguard for the subscribing rich and the protection for the suffering poor that any serious mismanagement could be pointed out and exposed. But I do ask editors to be a little more fair in publishing attacks without asking for explanations, and to take, if I may venture to humbly ask this of a body of men, some of whom have generously helped me in hospital work, a little more kindly and broader view of any mistakes we may make when they are mistakes of individuals and not of our system.